Surge protection strips are standard equipment for desktop computers, and many users even install uninterruptible power supplies under their desks. Yet every now and then a system simply refuses to boot, showing signs of having been fried. Don't forget to lock the back door'the power cable isn't the only conductive path to the motherboard. A computer with the phone cable attached is vulnerable to lightning strikes or power spikes that come in the back door through the phone line, destroying the internal modem and possibly damaging other components. Easy to carry, the 1.8-ounce TeleTester Pro is a good $40 investment for protecting a notebook PC. Travelers with notebook PCs face special dangers. New hotels offer LAN connections in rooms, or at least shielded data jacks, but most notebooks get plugged right into the phone line. The danger here is that hotel phone systems often run through a private branch exchange that lets users share a certain number of outside lines and also talk internally. Some PBX systems do a poor job of regulating power and overjuice the phone lines. It's not much extra current but enough to damage a computer. TeleAdapt Inc. has added to its surge-stopping line a handheld tool that protects mobile and desktop PCs from power spikes delivered over a PBX or phone line. The TeleTester Pro looks a bit like a handheld stun gun, but it stops danger instead of pumping it out. First of all, the device is useful for phone line diagnostics. In GCN Lab tests, I found it quite easy to use by plugging in the phone line in question and hitting the Check button. The device draws all the power it needs from the phone line. A green light means the line is safe for computer use. The TeleTester also can measure the polarity of phone lines. Sometimes, especially when traveling, you will encounter a phone line that works very, very slowly with your modem. In tests with such reverse-polarity lines, I have seen a 56-Kbps modem connect at a dismal 19 Kbps. 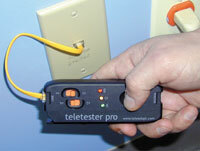 The TeleTester Pro can reverse line polarity. Simply change the inner and outer line switches on the tester to clear your modem for full speed, or at least as fast as you can get through a PBX, which is usually about 33.6 Kbps. That's a lot better than 19 Kbps. The TeleTester Pro has built-in surge protection, too. Even if a line is safe when you test it, it can still transmit a sudden spike from lightning or from internal phone system problems. Leave the TeleTester Pro plugged into the phone jack ahead of your notebook as a last line of defense, because losing a $40 tool is better than frying a $2,000 notebook. I generated surges along a phone line in a closed system by plugging in a broken phone and also by constantly clicking into the line. A power monitor detected the dips and surges in the line, but my guinea-pig notebook came through unscathed because of the TeleTester Pro. Even if you leave it plugged in, use common sense and turn off the computer during violent thunderstorms. No need to tempt fate. The TeleTester Pro is going to become my new best friend on the road. Its ability to reverse line polarity to speed up connections is terrific, and the surge protection will ease my mind. At 1.8 ounces, it won't weigh me down. It should fit into almost any computer carrying case. Users who have experienced random computer crashes also might want the device for desktop systems to guard against surges that come in through the back door.